My name is Cyndee and this is my first garden. When I was a little girl growing up in New Jersey, we had a backyard garden, mostly with tomatoes and peppers, but we tried a few other things as well. I used to help take care of the plants and the smell of tomato plants brings back a powerful nostalgia for me. I have wanted to start my own garden for a long time, but my efforts at container gardening in apartments fell short. Tomatoes are quite difficult to grow in containers in Texas because of the extreme heat; they dry out very quickly. Also, as I later discovered, the containers I was using were far too small. I have wanted to start a garden since we bought our house in 2009, but life kept getting in the way and the start up tasks and costs seemed overwhelming. This year we are finally doing it although I am not sure how much we are actually going to harvest given numerous screw ups and challenges already! I’m following a planting calendar recommended by a local community garden, but the extremely unusual heat and almost non-existant winter in the past year has me worried. I planted my winter veggies on Feb 26, which is on the late side, and they are growing extremely slow and having some pest problems, so I’m not sure if they’re going to make it. I’m trying to decide if I should go ahead and plant summer crops already or wait until April. The back wall will be used for vining plants and I need to build some kind of trellis. I am thinking about 6 feet tall, which would make it as tall as the fence. Suggestions appreciated! I have heard good things about cattle panel. 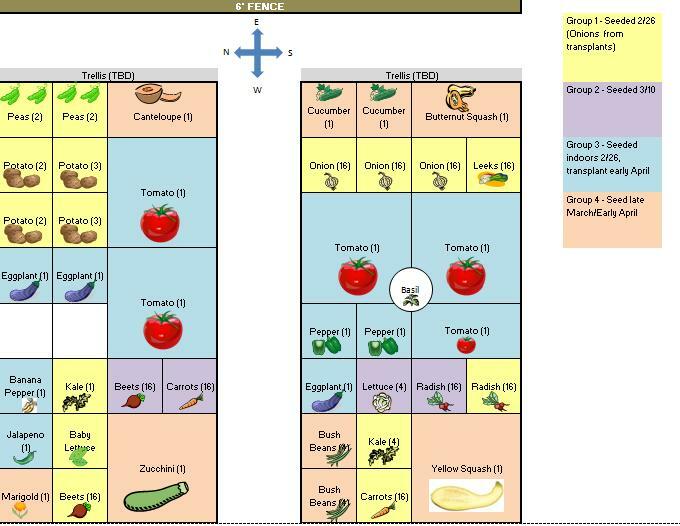 Here is my garden plan – I got a little crazy with clip art on a rainy day! 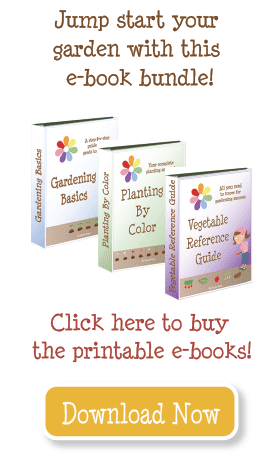 I tried to follow companion planting as best I could, but with limited space, it was difficult. I put cool weather crops around the squash to give it room to expand to the 3×3 space recommended. Similarly, the melon will have room to expand all along the trellis when the peas die out in the summer. I had originally planned 1 square foot for tomatoes, but on further research, this seemed unrealistic, so I had to lower my amount of tomatoes and give them 4 square feet. I’m hoping eggplant and peppers can fit in 1 square foot, but I guess we’ll see. I will fill in any empty spaces with marigolds and basil. Unfortunately since I started planting, my excitement has turned to frustration. Radishes after 3 weeks. Barely getting first leaves. 1. Nothing is growing. This stuff has been in the ground almost a month and it’s growing anemically. 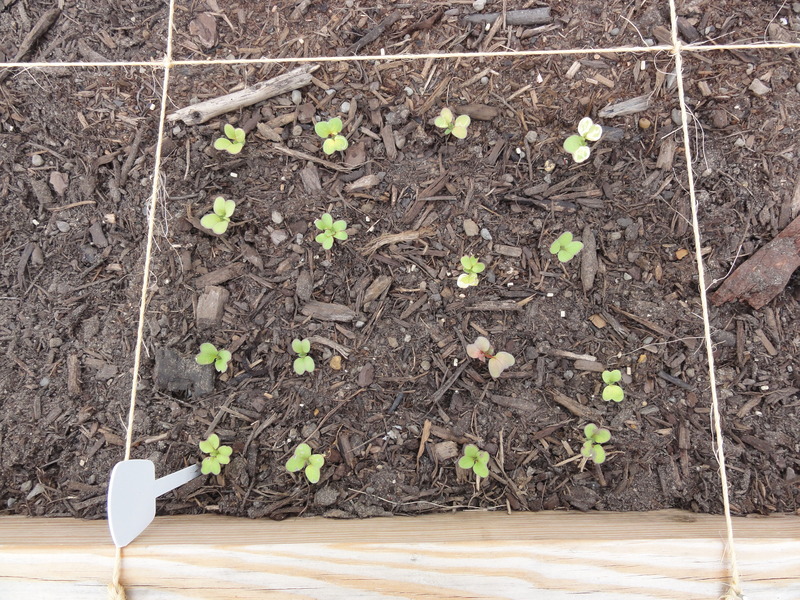 Here is a picture of my radish plants, 3 weeks after planting. It really started to hit me that something was wrong after seeing this, since I should be harvesting them in a week. They are kind of yellow, there are small holes in some of the leaves and some white lines. None of my seedlings have really done anything since they popped up. After doing some more research and doing a cheapie soil test, I discovered that the soil I purchased is actually quite deficient, despite supposedly having a lot of compost. I think it’s the wood chips. I fertilized this past weekend with Gardens Alive organic fertilizer, but I am not sure if that is enough or if it’s too little too late. I plan to add some amendments which will hopefully be enough for my summer veggies, but it’s probably too late to save most of my cool weather veggies. My poor potato plant is being eaten alive. 2. Pests. Fire ants have TAKEN OVER the beds. They are everywhere. I drenched raised mounds with orange oil, which did kill some, but obviously not all. I spread molasses, which has done nothing to deter them. I ordered some spinosad baits and fingers crossed they will work. Something is munching on my plants, but I can’t see the culprit. Witness the potato plant at right. These have actually been growing decently but the leaves are getting chewed up. Whatever it is, I can’t see it on the leaves. My snap pea plants also started strong but have flamed out. There was some leaf chewing in evidence, as well as brown spots on the leaves. The pellets you see are slug baits, as I read that it could be slugs and I saw some slime on the surface of the soil. 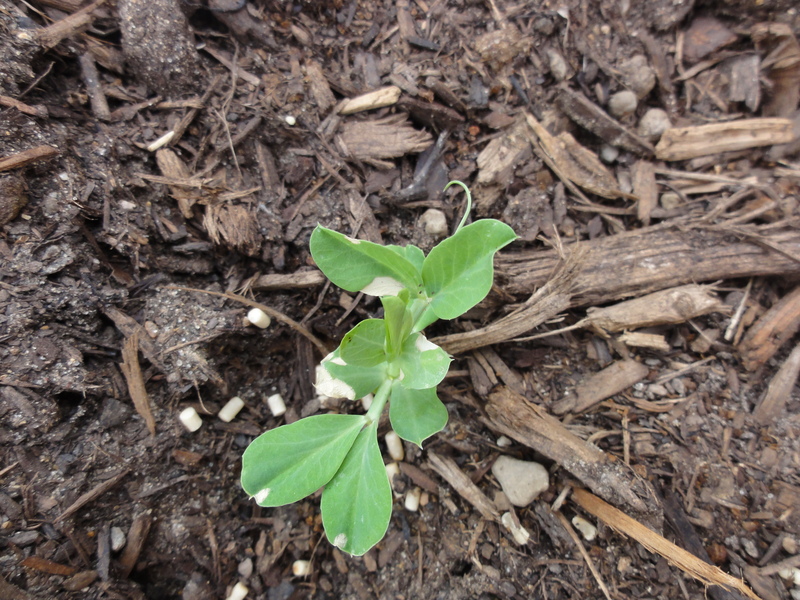 My snap pea plants are looking worse by the day which is sad because I really wanted fresh snap peas. I’d love any input on the problems I’ve been having so far. I am not sure how much of the problem is pests, or soil or what. Do you have any idea what could be attacking my plants? How can I fix my soil organically and quickly? Also, any southern gardeners, have you used shade cloth? My garden faces west which concerns me, I’ve heard some plants can get heat scald from being in direct sunlight all day in the summer heat. Finally, if you use drip irrigation, how long do you leave it on for and how often? I’ve been hand watering so far because I don’t have much planted yet and I just haven’t had a chance to set up my drip irrigation equipment. But I’ve heard that slow, deep watering is essential. I feel like I’m not doing a good enough job at that right now. I have recently moved to a small rural town halfway between Dallas and Houston, TX. I had to start a container garden just to able to get started. Anyway, I have staked off my my raised beds on a narrow strip on the south side of the house and anxious to start building. Two pests I see probable, moles and fire ants. The yard is full of moles and the fire ant beds are numerous. I believe my best solution for both is to prevent their entrance from underneath with a wire mesh finer than chicken wire for the moles and some kind of cloth for the ants. This may prevent them from building a nest since they like to dig deep which wont be available in the bed. Ants dislike coffee grounds. I add used grounds to any area I don’t want them in. That usually chases them away. Also had a tip from a friend, coffee grounds and crushed egg shells will attract earthworms. I’m a little late to this post but wanted to comment on Cyndee’s comment because I had the same bleak experience with the Vegetable Mix from Living Earth here in Houston. A huge waste of our energy, time and money. I am commenting mostly so other people might see and avoid the disappointing experiences that we had. There are other options and although they might cost a bit more, it is well worth it. I just hate it that Living Earth doesn’t care and they seem to get away with it because others don’t know. i see a lot of you are not following the “mel’s mix” formula from the square foot gardening book, which surprises me since this is a square foot gardening blog. if you mix in native soil, top soil, and/or, heaven forbid, miracle grow soil, you are not using the recommended formula. spring for the vermiculite, the peat moss, and the five different kinds of compost. it may cost more in the short-term, but the long term benefits will be well worth it. you only have to fill the boxes once, and if you make your own compost, you’ll never have to buy soil or soil amendments again. Nice start. First year can be a little frustrating. I’ll share some tips I found (this is my third year). Also, a disclaimer – I live in WI so seasons are definitely different. 1) I always add peat to my soil and layover mulch to prevent drying and evaporation – which I would have to imagine is definitely a problem in TX. 2) Quality soil and fertilizer is a must I have found, especially for fruit and veggie bearing plants. I do start with some cheap Miracle Grow for the tomatoes and squashes and melons, but switch to a quality organic fertilizer once I want fruiting to start. I recommend Jobes organics or fish emulsion based fertilizers. They are a little pricey, but I have found they are worth it. I used them on peppers this year and wow, did they take off and produce. 3) Only time will tell which plants do best in your garden. Try all different kinds and see which some up. 4) The fire ants could be hinting at aphids – which is what could be eating your potato and leaf plants. The ants and aphids share a symbiotic relationship (per Wiki) that the ants will move the aphids to different leaves and grazing areas in turn for the “nectar” the aphids produce. You can be sure the ants are definitely not eating the plants as they are primarily carnivorous. If you sign up for my gardening newsletter and select a fall color you will get reminders for a fall garden. I see no commets since March. It’s Now July. I planted my first sq. ft. garden following Bartholomew in “Sq. Foot gardening”. I have great green strong plants. Lots of blooms no produce, I didn’t plant until late, but am wondering what and when to try Fall plantings for South of Ft. Worth abt 30 mins. Suggestions??? for slugs try using beer, open a bottle of beer and either pour out or consume most of it leaving 0.5 to 1 inch in the bottom. then bury the bottle on its side at a low angle so the bottom side of the lip is near or at ground level ( so its easier for critters to crawl in). the critters crawl in and dont come out. A friend of mine uses this technique for his hastas. You will have to replace the bottle as evaporation occurs but then the bottle is recyclable. Okay, it has been about two weeks since I fertilized. The garden is doing better. Tomatoes are setting and the radishes started growing. Things are not wilting in the day time and I have a few squash on the plants Fish emulsion can be done every two weeks so I am going to repeat the fertilizing this weekend. Good luck y’all. Bye! Hi! I have a garden in Dallas and had the same problems. I tried mixing native soil and that did not help. (see earlier post). I heard there were soil testers at places like home depot so I went and got three (one for each bed). They were about $4 each. They showed low nitrogen and phosphate so I added fish emulsion and rock phosphate. That seems to be working. Things are greener and growing some now. It might be too late for the spring garden. I hope the fall garden does better. Jennifer, according to my planting calendar you might be able to still plant melons and summer squash, but I wouldn’t expect much. Most plants go dormant when we consistently have high temps above 95 and lows above 75 and we will be there very soon. But you will be ahead of the game for your fall garden – start planning and getting seeds now, a lot of places have them on clearance. We just moved to Forney, TX from IL. Its a bit late, but we just put in two raised beds. Any ideas on what can be planted this time of year with the heat? I’ve never had to deal with this much heat or sun before. Bridgett, I know how you feel. It has been a frustrating year for me. Melons, eggplant, tomatoes and peppers are known for being heavy feeders, so it wouldn’t surprise me if your soil is a bit short on something. I suspect it would be nitrogen, since woody soil seems to have that problem a lot. My recommendation to you is get a soil test from Texas A&M (http://soiltesting.tamu.edu/). I know everyone says it, but just do it. I finally did mine, and I wish I had done it in the first place. It is only $10 per sample and you will get the results back in a week. I had gotten some home kits first but they are hard to read. Anyway, I was just throwing tons of different organic fertilizers to try and improve my soil. My warm weather plants are doing ok (cool weather plants all died), but I still had some doubts. So I got the soil test. I also tested some of the original soil that i pulled out of the bottom of my bed under some dead plants. Results: Original soil had almost NO nitrogen. Like, there wasn’t even a bar on the bar chart. It was below “extremely low”. The amended soil had very low nitrogen still, but much improved. However, since I was using a mix of different organics, my phosphorus went through the roof. Phosphorus builds up in the soil, and when it is too high it can make it hard for plants to take up iron and zinc. Which can cause more problems. Yay. So if I’d gotten this done sooner, I would have known to just stick with high nitrogen fertilizers. Now I’m not sure what to do. I wrote a seething letter to the company I bought my soil from and they offered to replace the soil but 1) I’m not sure if the replacement soil would be any better and 2) I think most of my plants would be killed if I tried to replant them now and I’m just getting some tomatoes and eggplants and a few peppers and cukes and I don’t want to lose everything. I’m waiting on them to give me the results of the test of the replacement soil to see if it is any better. Lessons learned: get a real soil test as soon as you start. And don’t buy soil that has huge pieces of wood in it if you can avoid it! I’m just South of Dallas and used the cheapie garden soil mixed with cheapie top soil and a little high-dollar organic manuer/chicken litter compost. (Go figure- I paid the most for poop!) like Chelsea, I found that there was a lot of uncomposted wood in the garden soil mixes, and as a result, I have a TON of mushrooms. In this blend, I have been able to grow zucchini, squash, peas, and pak choi really well. My tomatoes, peppers, watermelon and eggplants, however, seem stunted. They aren’t dead or diseased, just small and stubborn. I’m guessing they need better nutrients to fruit. I’m trying to stay as DIY and organic as possible, but every “compost tea” and organic fertilizer treatment I’ve found says “use regularly”. What the heck does “regularly” mean? Weekly? Biweekly. Every time I water? While it’s too early to know for sure, the early signs are that we are going to have a VERY successful first attempt at our square foot gardening. After just six days every vegetable we planted is showing some sprouts. I know the summer heat will tell the final story, but my wife and I are very encouraged by these early signs of success. The boxes we used were based on the plans of a self-watering garden box in the April issue of The Family Handyman. I built two 5′ x 3′ boxes, one soil depth of 6″ and the other 10″ (plus 4″ for irrigation piping on the bottom). It was a fun project to build and from what I’ve read about this type of box we should see good results come harvest time. I used the “Vegetable Mix” from Living Earth as the main component of my soil, but amended it with peat moss, mushroom compost, organic compost, vegetable food, and fertilizer. I put the fertilizer just above the irrigation piping, about 1/2″ of soil above the pipes (from what I read that’s the best place to put the initial fertilizer, since the nutrients will work their way up along with the water). I put the food about 1″ below the top level of the soil. I’ll report back later when I’ll know more for sure how well things are going. I’m down in the Houston area and can totally relate to your frustrations. Hubby and I are in our fourth or fifth year of planting a garden, and let me tell you… the first years did not go very well at all–even with raised beds. I’m no gardening expert, but I think it took a few years for the soil composition to work itself into something the plants like. We add some compost each year before we plant, along with a bag of some miracle grow soil mixture, and each year our garden has gotten a little better and better. My advice is to just not give up! We’ve finally been seeing some success that makes it all feel worth it, but again… it’s taken about 4 years to get here. So just realize that the first few years will have issues, you’ll be able to learn from them, and your garden will just get that much better each year. 🙂 Just keep reading tips and tricks from wherever you can pick them up and keep at it. Good luck! I am growing in southeast Dallas. I have tomatoes out now and squash and watermelon. Some beets and carrots also. I’ll post more later. I planted last year with garden soil from a local nursery. The soil did not seem to hold moisture well. I grew tomatoes, beans, and squash fairly well but the lettuce and beets sprouted then died. This year my lettuce was doing bad again so I turned in some native clay. I thought that would help the ground hold moisture. So far, it looks good. Cyndee – I’m in Keller. My radishes looked like that last year, and I gave up on them, but they still got water as a result of being near some other vegetables that were doing fine. A few months later, they were sizable and edible. I have no idea why it worked out that way, but you might just try some patience on them. Kevin, yes that is the soil mix I used. I live near you so it was probably the same location too. Very disappointed in it! I’m glad that you had the foresight to amend it before planting. Unfortunately I did not, as it sounded like it had everything I would need and they certainly did not tell me otherwise. I did add a bunch of amendments in the past month, but wasn’t able to mix them in as well because of what was already planted. Hope that your garden is fruitful as well! I don’t think the stuff I planted in February is going to make it except maybe the potatoes, but I am hopeful that I’ve added enough to the soil to make my summer veggies grow. 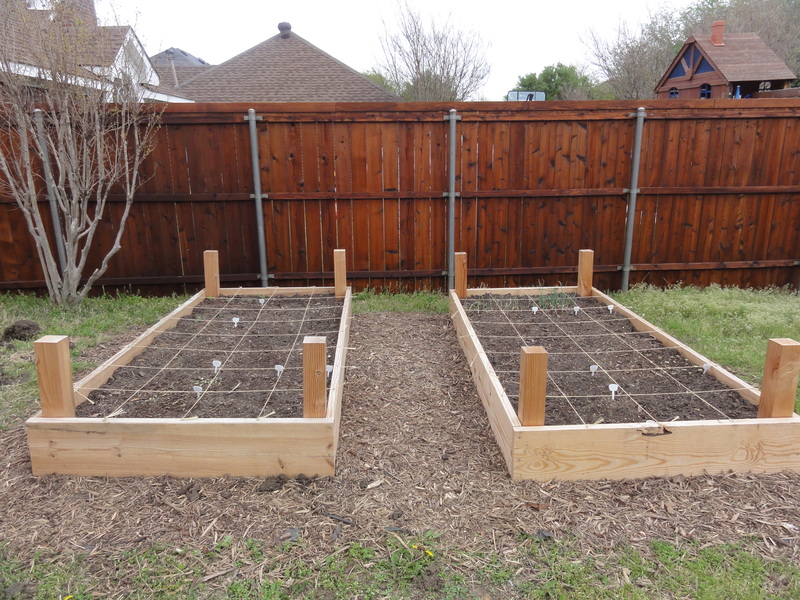 My wife and I live in Flower Mound and are trying the square-foot method in raised beds this year as we did not have much success with our first garden last year. I just finished building a couple self-watering garden boxes based on plans in The Family Handyman magazine from this month’s issues. It was a fun project and I’m pretty confident they will do much better than the ground based garden we did last year. One question I have for you, is your soil the Veggie Mix from Living Earth? It kind of looks like it as that’s the mix I started with. I also added some mushroom compost, organic compost, peat moss, fertilizer, and plant food in my boxes. We’re hoping to have success with tomatoes, lettuce, Jalapenoes, cilantro, and more this year. I hope you have a more fruitful harvest this year than you’re expecting. Maybe the plants are just taking longer to get going??? Santha, here is the planting calendar I used. It’s from the Coppell Community garden, they have a lot of useful info on their site. There’s also a planting calendar in Howard Garrett’s organic vegetable gardening in Texas book. It’s pretty similar, but a little out of date as our average last freeze has moved a bit earlier since the book was published in the late 90s. And this year is particularly unusual as it looks like our last freeze was mid February and I doubt we will see another until November! I also live in the Dallas metroplex. I am also doing the square foot garden this time. Your post was so timely and loved your ideas. Can you please share your planting calendar? Thanks for all the advice! Prudent Homemaker it’s good to hear from someone who also lives in a hot area. I’m starting to think I put my garden in the wrong area, but it’s the only spot that gets full sun. However, I may try to squeeze my cool weather vegetables in my herb garden next year. The herb garden gets sun from about 6am to 1 pm, so little afternoon sun. I was a bit worried as most herbs require full sun but so far they seem to be doing okay (these were all transplants bought from the nursery). I will have to try the glass jar trick next year. I did add a big bag of earthworm castings to my garden this weekend along with a bag of blood meal and another kind of organic fertilizer. Do you know of the worms sold at bait shops are the right kind? I have been to 5 different nurseries in the past week looking for various things, and didn’t see worms for sale. I haven’t seen any worms in my raised beds yet. The bad bugs found them easily but so far the worms haven’t showed up. I want to grow blackberries but I was not aware grapes liked heat, so I will have to try those too! I put out spinosad baits for the fire ants this weekend. *fingers crossed* that this works. I will have to look in to borax. I heard it’s a good soil amendment anyway. Emily, it has been around 80F most of the past few weeks, so I don’t think that is the issue. My radishes and lettuce have been turning interesting colors so it just points me in the direction of malnutrition. 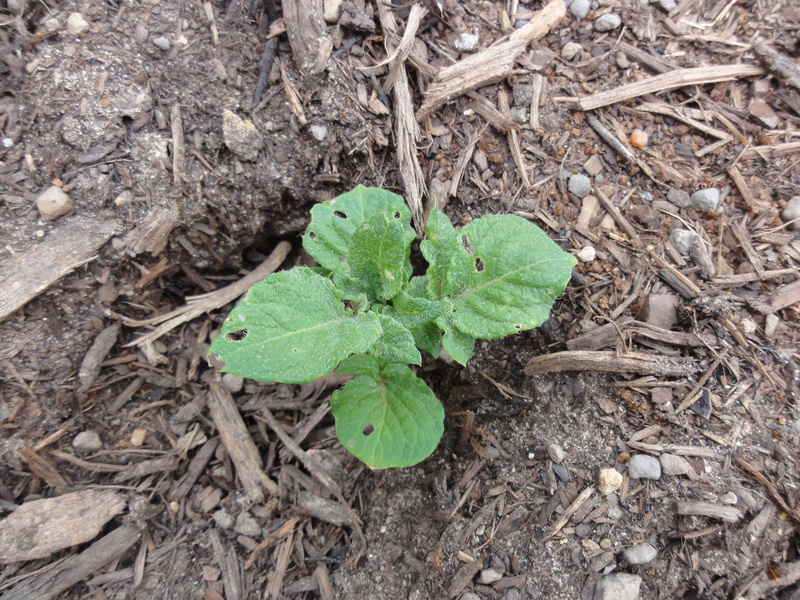 My potatoes (leaves only) have been growing like gangbusters, though, and are bright green. Perhaps they are still feeding off the seed potato? I don’t know enough about botany. I know you’re right about possibly having to use chemicals these year just to salvage my crop. I will wait a couple weeks to see how my summer vegetables do. My seedlings that I started indoors aren’t doing great either, and they are in a seed starting mix that I bought from the store. But it’s only peat moss and vermiculite, so I’m not sure how they are supposed to get nutrition from this. I’m going to move them to bigger pots with compost this weekend. I’m relatively new to gardening, but this year I’ve decided to make an attempt at a small veggie garden of my own. I’ve read that praying mantises are good for getting rid of insect problems. Maybe this would help with your fire ant problem. Anyone else have input on this? I’m considering putting some eggs near my garden to help ward off insects as well. Try grits for the ants . Cyndee–I’m sorry you’re facing so many challenges already, and you’ve only just begun! Hopefully the comments made here can help you. *Your timing for the winter veggies is dead on with my Planting By Color schedule. They may not grow well if temperatures are above 80 F. If it’s still cooler than that, the problem is nutrients, not temperature. *Now is a great time to plant Beets, carrots, potatoes, radishes, Swiss chard, and lettuce. Even though the temperatures are warmer this year, only plant very tender veggies if you are SURE it won’t freeze. So I’d still hold off until April to plant green beans, tomatoes, peppers, eggplant, etc. If you have a way to protect them from frost, you can try planting those things earlier. You’ll just have to be careful to watch the weather in case it gets cold at night. *I’m going to try the cattle panel this year too, so I don’t know if it’s the best yet, but I think it would work well. *If you want to free up some squares, you don’t need to give radishes their own spot. Plant them around the tomatoes, zucchini, and in between other veggies when they are small. The radishes harvest in 20-30 days, so you will pull them out before anything gets too big. And in the heat of the summer, they don’t mind a little shade. *The plants definitely show signs of malnutrition. Google “compost tea” and use something like that regularly. Jerry Baker’s books have tons of organic “boosts” that you can mix and apply. I would definitely amend the soil for summer veggies, and retest the soil. Keep adding until it’s got lots of nutrients. And even if you don’t do this in the future, this year use some fertilizers regularly (in the veggie section of my site each page has suggested fertilization schedules). *The pests are a problem, but one of the best solutions is to get your plants growing strong. My green beans always get shredded when they start, but once they get to a certain point that particular pest (I’m not sure-cutworms maybe?) leaves them alone. So give them the nutrients and water they need to grow quickly. *Watering is tricky. Stick your index finger into the soil as far as you can–if you’re touching moist soil your plants are probably okay. If it’s dry, water. When I hand water I tend to give each square about 1 liter of water at a time. That way the area around it is moist and you can go longer between. Once you set up drip irrigation, turn it on and let it run. Check it every 15 minutes or so–at the point when you think the soil is evenly moist down about 3″, stop. Then set your automatic sprinklers to go that long. Check every day to see how long it takes to dry out. If you are under watering, the plants will wilt. If you are over watering, there is no signs! So err on the side of less water, until temps are above 90 F.
I know you want to stay organic, which is awesome. If you can find the supplies to do it that way, go right ahead! But if everything continues to struggle, I would break out the chemicals. The small amount of fertilizer and pesticide you use will still be MUCH less than what’s used on veggies you would purchase. But if you don’t use it, you won’t have anything to eat. I feel like it’s a good idea to have success, then find ways to improve it every year. That might mean starting with chemicals and moving to organic–especially if you started with deficient soil. Be sure to fill your beds with really good compost this fall, and again next spring. Soon you should be growing like crazy! I have drip irrigation and I live in the desert, where summers are 116º for several months. We have 5 months of temperatures above 90º. I have drip line with holes drilled every 6 inches (it comes that way from teh nursery). It’s the only way to keep plants alive here. Plus, since you’re not watering overhead, you reduce the chances of having powdery mildew. The brown spots on your peas look like they are being burned by the sun. I don’t use shade cloth myself, but there are those here who do. My peas get afternoon shade, which is pretty important here. To keep them from being eaten, when it’s cool (not when it’s hot!) I have covered them with empty jam jars. It acts as a mini grenhouse, but has also helpe to protect them from being eaten when they are small. My peas have had real trouble with being eaten the last 2 years; this has been what I’ve needed to do to get any peas. I have done this on my lettuce as well, and the ones that are covered grow 3 times as fast as the ones that are not. You do have a LOT of wood in your garden. Cna you get some earthworm castings to add to your garden? I would also recommend buying some worms to help. Any other organic matter that you can add will help as well. My last garden was .16 acres; you can do a lot more than you think in your garden. For example, you can grow grapes along your fences. They don’t mind a southern exposure, even in the hot sun. On your western fence, which should get some afternoon shade, you can do blackberries. Any trees or bushes that you put in can be edible, expanding the use of your garden (not just in your raised beds). Fire ants–a dreadful nusisance. I have tried ant pellets and that has gotten rid of some. I have tried boiling water in the holes in the morning. Have you tried boric acid?